We know how helpful it is for kids with language impairments to have access to visuals and opportunities for massed practice. And we know how hard it is to break down higher level language tasks (e.g., explaining predictions and inferences, forming cohesive summaries) into discrete steps. Oftentimes, students get so bogged down with the vocabulary from the get-go that they end up muddling through or just giving up on the task (e.g., whose cruel idea was it for "conclusion" and "solution" to sound so similar!?). When the process is that daunting, you're not going to come close to the amount of repetition needed for internalization and progress. I've been mulling around these ideas over the past year and am proud to announce that I have a solution! I've identified what I see as "the big six" language skills that my students struggle with: summarizing, comparing and contrasting, explaining opinions, using diversified vocabulary, justifying predictions and inferences, and defining words. For each of these skills, I considered the best visuals and mnemonics that have worked in the past, paired them with streamlined steps/"recipes," and formatted it all to fit on a small card. When I introduced version 1.0 last year, they were a hit with the students as well as the staff. 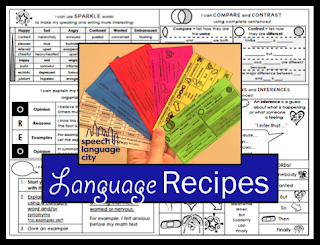 My kids actually ASKED to take their language recipes home with them and teachers requested class sets as well. And so I slipped the sets onto a binder ring and passed them out like Halloween candy! After a bit of sprucing up, version 2.0 is ready for you to run with! I recommend printing the cards on brightly colored paper and laminating them for durability. Whenever you are working on language skills, have the cards at the ready. Eventually, you want to teach the kids to be listening for certain key words and independently pull out the visual support they need to answer (e.g., "retell" = summary card). On the summary card, I've used my own visuals for story elements. See the key for some explanation. Bonus - The key also doubles as a great visual for the therapy room! The six cards (including the key) are available for purchase on my TpT store. As an exclusive for my blog readers, check out the key and the compare/contrast card as an exclusive "try before you buy" download. As always, share your thoughts in the comments!